Thanksgiving is one of the only times of year that we all come together. Problems are put aside, and we sit around the table, and give thanks for what we have.This applies not only to humans, but our four-legged friends, too – especially shelter animals. This is something that occurred to a woman named Christie Chipps Peters, who is the shelter director of Richmond Animal Care & Control (RACC). Christie was gearing up for the holiday back in 2014. 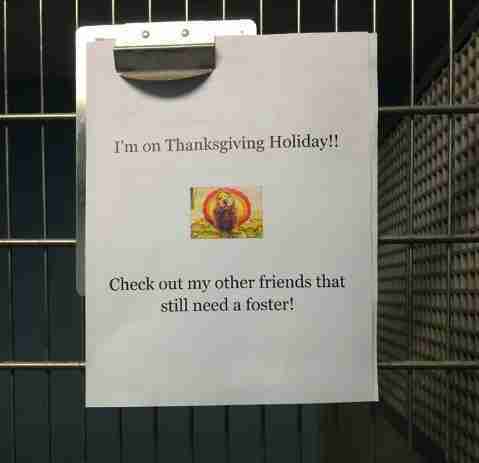 She imagined people getting together with friends and family for their Thanksgiving feasts, while back at the shelter, it was just another day for the poor homeless animals in her shelter. Christie decided to take action, and put a call out to the community. 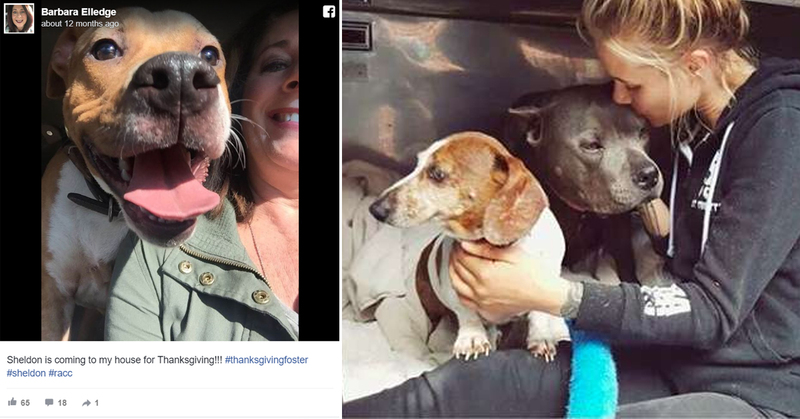 Before she knew it, 35 animals were out of the shelter and on their way to spend Thanksgiving with a generous foster family. While it’s not quite as good as getting the animals into their forever home, it was such a great experience for the pets. The pets got a delicious meal, along with plenty of love from guests, and even someone to snuggle up with on the couch for a post-dinner nap. The Thanksgiving foster program is now in its fourth year, and the number of pets who have plans for the holiday has nearly TRIPLED, thanks to an overwhelming amount of people who apply to participate year-on-year. It’s great to hear that some of the families find themselves falling in love with their foster pets, and make the adoption permanent. 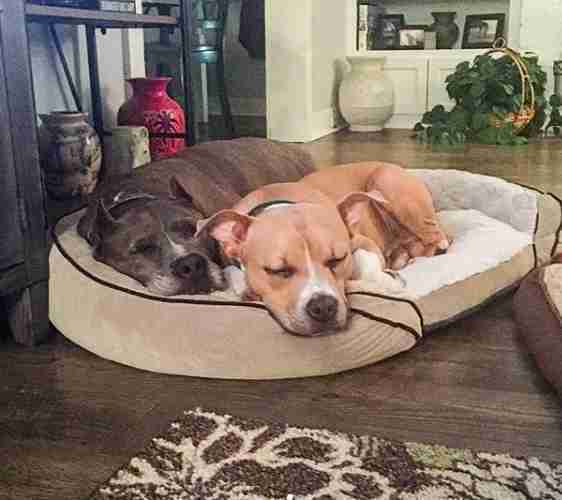 One of the ways the shelter makes this process easier is that, if families do choose to adopt the pet they host, the shelter waives the usual adoption fee. This year, Peters has a few senior animals in mind that she especially hopes will find homes for the holidays this year. This year, the shelter will be pairing families with a pet from Nov. 18 through Nov. 21 – ie, right now! If you’re in the area, get in touch with RACC as soon as possible. Fosters are interviewed so they can be paired with the perfect pet, and then they can bring the animal home that day for the week-long foster. 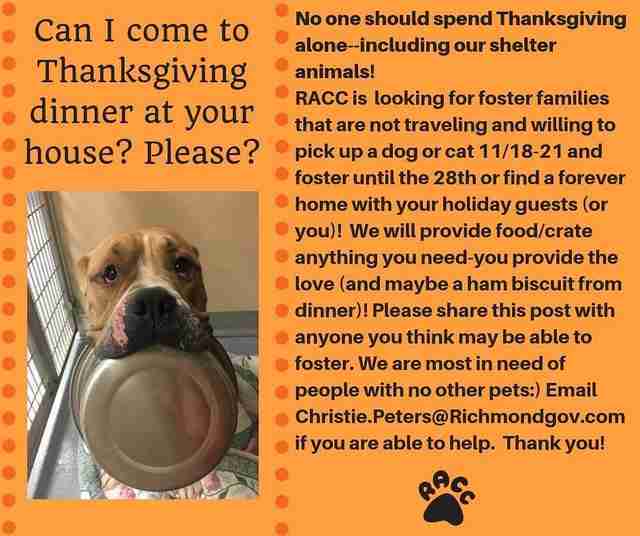 As expected, Christie has already had an massive amount of interest from people all over Virginia hoping to host a pet for Thanksgiving this year. And it’s not just the animals who end up benefiting from the experience, she says. I’m so glad we have organisations like RACC out there to look after these gorgeous animals, as well as kind families who want to take them in at this special time of year. Here’s hoping that they all find their forverhomes soon.